New signs at Patrick Henry Park? 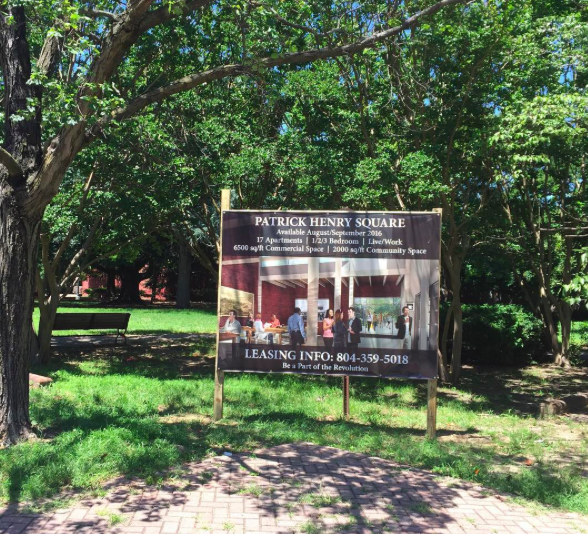 These new signs for the Patrick Henry Square development went up today at the corners of 24th & Broad and 25th & Broad. Josh Bilder of Sterling Bilder said in a phone call this afternoon that the signs were temporary, that they would only remain in place for the months it would take to complete the project. I asked Builder if he had permission to place the signs in the park. Billed stated that he had an agreement with Parks and Rec to take care of the park. When pressed to say whether or not the agreement included the signs, Bilder hung up on me. I really dislike this guy and his company. And it doesn’t sound like he had permission. That’s not HIS park to do with as he pleases. What’s next? Construction equipment and materials will be temporarily sitting in the park? Somebody should forward this to the guy that runs this outfit and see what bad feelings and unfavorable press he is generating with his stupid sign. I don’t pay taxes to furnish a venue for his advertising, and neither does anybody else in this city. I concur with #5. This guy is an asshat who left hazardous materials, large amounts of waste, and huge machinery in the alley, which blocked access to residences in the back. He gave a one-day notice that folks who had parked in the back for YEARS had to move their cars or be towed.. Only to not do anything with the space for over a year. Now signs. Today, in Patrick Henry Park, Mr. Bilder’s company erected illegal signs in a public way as defined by the City Code, Division 2, Section 38-111 – “Definitions”. This action is considered “unlawful conduct” under Division 2, Section 38-113. Under Division 2, Section 38-115 – “removal and collection of costs” the City Code states that “any violation of this division is hereby declared to be a nuisance”. In the same section the Code states “any person may abate the nuisance created by a violation of this division without liability for doing so”. This evening I abated the nuisance of the signs and tomorrow I will contact Richmond’s Dept. of Public Works to arrange for the abatement of the wooden structures and filling in the holes created by the sign posts, if Mr. Bilder does not do so himself. Are there plans online for this run through the CAR yet to see the layout? From the bits I have seen there is going to be some sort of courtyard in the new complex that leads out to the park so guess if the two will be interactive, he may have made some arrangement to maintain the park even if he doesn’t own it? @13 Rick… you may be jumping the gun without knowing the facts first. Bilder may have a special arrangement with the City P&R Dept to post the sign and if so, you will be liable for the costs to have it replaced. If anyone would like to join me, I think I’ll “Wanksy” his sign this weekend. Bevs for all who assist. Under the cover of darkness, of course… and maybe when Engine 1 is out on call. Where is Rick Tatnall, CHPN.org, etc. with their rightous indignation for the proposed towers that will block the view from Libby Hill Park? Oh that’s right no one had shown up to see Joshua Bilder speak in opposition, rather than the temporary signs. Hmmmm? @11 Eva…was the property you were parking on yours, the city, or his? Just because you did it for years doesn’t make it right. Unless you had a dead car parked, I assume you could have simply parked on the street like everyone else within 24 hours? No big issue. It seems like you are upset because your free ride ended. @16 dontmincewords… I must be overlooking something here. Someone who is trying to restore property and bring income to our neighborhood is being ridiculed. As I said, why would people tear down or spray obscene graffiti on a sign he may have been given the right to place there? And what is everyone up in arms about it? They are temporary and not hurting anyone being there. His project will work in conjunction with the park anyway for those visiting businesses within the complex as well as the residents yet open to all. As I see it the park is blah as is and from an article I wrote a while back, many, even planners, see it as ugly and an abomination and not a good use of the property. Poorly planned out and currently does not look anything like the original layout which once had a working fountain in it. There are bigger fish to fry concerning our city and Church Hill than squawk about a sign and too few publically getting involved to make it happen. Call me naive or misinformed…I’ve apparently not been in Church Hill long enough to become crotchety. I totally understand the impact of signs being posted in a historical residential area. But, weren’t we all recently praising Josh Bilder for the beautiful marquee at Liberty Public house (maybe my facts aren’t correct and I’ll humbly conceed if so)? While he’s posting signs, he should post one at the entry of Church Hill that warns that those who enter will lose all sense of humbleness, kindness and commitment to neighborly (real…not just message board) communication. Two illegally placed signs for a private business (privately-owned, for-profit developer) in a city-owned public park. Shameful. I’m hopeful it was an honest mistake by the sign contractor. Hoping both signs get removed before the weekend. We joked last night that the city is now so broke that it’s renting billboard space in public parks. Which park is next? Libby Hill? Jefferson Park? Why isn’t anyone all up in arms about the large porta potty in Chimborazo playground right by the petanke courts? The City is paying a weekly rental fee on this. It should be removed! @20 Heather, I’ll second that! Everyone, yes… it is a public park owned by the same department who owned the property Josh Builder purchased adjacent to it and is being designed to work in conjunction with his project (hence the photo on the sign depicts). I am sure he obtained permission to place them there since the park is basically a part of the whole picture with the Patrick Henry Square development. Heather, you will always have people who hate something or someone. The East End Theater closed as a theater in 1970 and the last use of it as a church was in 1983 so it sat for 30 years empty and was at one time slated to be demolished which I intercepted. Even after it was converted into apartments with a restaurant on the ground floor, some still complained that a building brought back to its original 1938 look when built, is an eyesore… go figure. Some people must be miserable in life and not happy unless they inflict their misery on others. @23 Jean… was this potty put there as a courtesy for those using the court? Or as a substitute for the lack of a public restroom? Or left over from some event? I know the city is sloooow on many things. There was a mobile floodlight that sat for a while after the bike races on the corner of 18th and Broad which I am sure was also being rented and was at risk of vandalism. Has any one called the city to ask about the signs or permission for same? Eric, It was not put there for a special event and as a substitute for lack of a public restroom it is highly questionable. Libbie park has public restrooms under the park house that have not been available for 20 years. The same goes for chimbarazo park. They do not have porta potties! Why should “those using the court” have this courtesy at tax payers expence ? It might be different if the City had enough money to keep up general maintenance in the parks and public areas but as we all know that is not the case. I am going to find out who requested this and who authorized its installation. Regardless, It needs to be removed! @ Heather, I think any folks who seem negative are the highly vocal minority. 97% of the people/neighbors I have come to meet and know have been some of the most gracious and welcoming folks I have met in my whole life. People do get nervous when they don’t have control over some change but all in all, I find most well intentioned. It may be that Bilder has permission to place the sign or thought he did as part his park maintenance agreement. Maybe this is nothing more than simple misunderstanding of what he was and wasn’t allowed to do. The some of you want to take this into your own hands without even bothering to check the facts is more than a bit worrisome, especially since one of the commenters is a candidate for political office. I don’t think I will be voting for a school board candidate who thinks it is his place to take the law into his own hands. We have enough politicians around who lack any self-control. But seriously, if the sign is a problem–and I absolutely think it is if Bilder didn’t get permission–then get it removed through official processes. But taking up torches and pitchforks against someone who is investing in the neighborhood is not exactly welcoming to others who are looking at converting vacant and derelict properties to a habitable status. Why would an investor want to plow money in up here when the locals are ready to burn them at the stake and engage in vigilantism if they make what may be nothing more than an error. A collective “settle down, Francis” is called for here. wow. for once, i agree with eric huffstutler. much bigger things to worry about people! I agree with two of your commentaries. That to “check first” before taking action and about people being on a witch hunt. The part I have issue with is that some are up in arms over a “temporary” sign in the park – part of the project. A park I never see anyone in except vagrants so why is it such a big deal? One the city is not properly maintaining but Builder will so I would think you could cut him some slack? I can’t help but think all the complaints are aimed at personal feelings towards Builder rather than what he is doing with the project? What will people think after the Square is completed and links the park itself? I am sure people will be up in arms about that as well. Hey Jean…. In reference to the porta potty- we should be careful what we ask for- for those of you who have frequented the park pre-potty, having no facilities has never stopped folks from urinating and deficating in the corners around the bathroom building. It was awful most of the time. Having this John in position seems to have reduced the bad behavior. @32. I don’t know Mr. Bilder or have much feeling about his projects either way (other than while I personally find the design of the blade portion of the marquee on 25th Street pretty heinous, I appreciate his willingness to renovate that derelict property), but I would agree this as much about anger toward him as it about the signs themselves. People seem to want to shoot anyone who wants to invest up here, but doesn’t do it in the way they want. Maybe Mr. Bilder’s projects aren’t ideal (I don’t have an issue with them) but I don’t see the complainers or the vigilantes stepping up with their money to get these jobs done. @30 – Liz…thanks, I needed that! What do you find objectionable about the blade sign on the theater? It is like the original on the building from 1938 and a rusted hulk when he purchased it. He even kept it conservative because if you look at the photo in the link below, there were neon lights that outlined the backbone of the blade as well which he did not add. Letter outline and the neon bases can also be seen. The sign was also in tax record photos. I was influential in changing the marquis design. They were going to build a rectangular box but again the tax records, and knowing other theaters were built by the same architect, show that it had a more triangular shape and so was changed in the 11th hour. The original marquis was removed years ago due to safety issues being dilapidated. That is what the blade looked like originally? Do you have pictures of the original? I just think it looks bling-y and tacky and could not imagine it was a replica of the original blade. But if it is a faithful recreation of the original, then I withdraw my objections. @38 BAF I want to post a photo for you to see but can’t here and the Facebook version of CHPN does not have the same posts per topic as here so… I will attempt to link the small tax photo from my personal page here. The smaller you view it the clearer it will be. It is the only known photo of how it looked while running that I have run across other than one of the front view of the marquee. @39. Thanks for that. It looks pretty similar. Have to wonder about whether the colors and//or materials are right. It just doesn’t feel true to period. The blade seems plasticky and shiny and the color seems unusual to me. But maybe I’m wrong in this. A lot of movie theater signs are red and white (or red lettering lights) which stands out at night when lit. The Virginia Rep. sign is also red and white. In fact, signs back then were enameled but red enamel is now outlawed and can only be patched repaired with glossy paint. I am sure Builder looked closely at paint residue on the old rusted sign to know what was there. In the b/w photo it looks like the lower horizontal lines on the bottom of the blade are chrome rather than painted and a long base block (part of the deco stacked design) on the original, is missing on the repop. The rainbow top curve was probably a racing waterfall running light (animated) as well as painted and of course there were more neon on it going down its back. May have been sequential racing lights on the marquee as well. But in our area any neon tubes would be at risk and be glad the letters light up. 🙂 Laws have changed since the 1970s concerning animated or neon building signs along roads unless on historic buildings. As you said, close. But not all of the old sign was there to know how it was made and only these grainy photos are available at the time to work from. To add yes, the blade sign look cheap the way it is. If they had all of the neon and chrome on it as the original had, it would look totally different — more three dimensional. The marquee frame also looks too tinny in white and needs to be black as in the photo. But it is better than nothing at all. I guess that is what I meant. It looks cheap. I’m probably just looking a gift horse in the mouth but I do wish the racing lights and the neon could have been restored. I wanted to update the concern about Josh Buider’s signs in the park. From the 2014 purchase agreements and ordinances, it looks like part of his purchase agreement was offering to maintain Patrick Henry Park. By City Code, the City Attorney, and Parks and Recreations and Community Facilities, it was approved. Even the plans show possible improvements added to the park by Builder. The Square he is building will include a Community Center which will face the park and have doors leading out into it so making sure it looks nice is all part of the big plan. So, I see it that he has a right to post the signs. Eric – that document mentions hardscape, play structure, benches, and lighting, all with with question marks. I don’t see where this document gives him permission to place signs in the park. And to diffuse the idea that opposition to the signs is anti-Bilder or anti-development – this is not so. I’m a fan of his work, especially the theater renovation, and am looking forward to seeing new life at Marshall and 24th. “Advertising/billboard type signs illegally placed in Patrick Henry Park near the corner of 24th and 25th Streets facing Broad. Signs advertise a privately-owned residential development adjacent to the park. Advertiser is a for-profit business and there is no city ordinance that allows the placement of such signs. “. I selected “Illegal Dumping” on the drop down tab. Hopefully, if we all flood the SCF system with posts to remove the signs, Rec&Parks will take notice allong with other city official(s) who can inspire their removal. @ Eric, if you took the time to read the City Code you would see that your interpretation is 100% wrong. Please feel free to check out the City Code at the City Clerk’s webpage link below. Place “Posting of Signs” in the search and you will be taken to Article III, Division 2, Sections 11-74 through 11-79. You will see that only City Council may permit signs in a public way (i.e. a park) “upon proper application for an encroachment or other form of variance from this division”. Fortunately we live in society and a City that does not allow the Department of Parks & Rec or any department to give away our public freedoms and liberties. Your assertions that the public should not care because the park and its users are sketchy and the signs were only “temporary” are very dangerous and are a sad example of the corporate entitlement mentality that is ruining our country. The next step after temporarily eliminating public rights and liberties is permanent elimination. I have been an activist for several years related to the City’s lack of enforcement of illegal signs and I have been removing them from the public way whenever possible. Mr Bilder’s egregious actions in arbitrarily placing these signs designed to benefit only him in a public park without any permission was more than cause for my actions. I have reached out to the City Clean City Commission to get the wooden structures that are illegally placed in our public park removed. I hope they will charge Bilder for the work and fine him for every day they have littered our public space. I second Elaine’s call to pile onto the See-Click-Fix report and to complain to Parks & Rec. My actions were not based on an anti-Bilder or anti-development stance, although I am anti-Bilder now. This is about following the rules and not letting commercial interests run roughshod over public interests. Would the neighborhood be as accepting of similar signs advertising for the CVS or ABC store down the street? Doubt it. Also: when does he have to finish this thing? One of the documents shows under Terms & Conditions a post-closing development covenant stating that the buyer agrees to complete the development 18 months after closing on the property. Or can this be put off indefinitely? Finally–am I wrong to feel like it may possibly end up that he somehow privatizes or limits access to part of the park somehow? Where’s my flowerpot!?!?!? I feel the need to take this all the way to a full, rolling Buzzy!! Seriously. This is some petty petty business. And candidate Tatnall, city, state and federal codes being as long and changing as they are, are you willing to work equally hard for all the rules? I mean, there’s a guy a handful of blocks away who, while blocking a public sidewalk, uses sign language to sell herion to cars that double park, blocking a public street. Sometimes he surrounds himself with school age kids, who he involves in his private profit-making venture. Are you going to abate that nuisance? Or, I might add, help our lovely city mow its grass? Because I guess, times being as fiscally freaky in richmond as they currently are, if the guy is doing upkeep on a park that otherwise would be overgrown and trash ridden, it feels fair and reasonable to leave his signs alone. And btw, where’s that good Churchhill outrage about our trashy overgrown public parks? No? More interesting (and less work) to go all Tea Party on Bilder’s signs? I did not say that the documents gave him the right to post signs. Just that as part of the purchase he agreed to maintain the park with “possible” improvements on his dime and the city approved it. If you are investing time and money in the effort, wouldn’t you expect the courtesy to post a temporary sign showing how the project will work in tandem with the park itself? I would think the city would gratuitously allow him to do so since it is their property he is maintaining. And the sign isn’t selling a product like canned peas but illustrates a development that will benefit is all. Answer this, as an alternative, how do you propose such a sign being seen by those using the park letting them know how it may be a public space yet will also be part of a conference center and possible changes in it are coming? Traffic will not see it at 24th and Marshall nor associate the two from that advantage point. But again, people are up in arms about a silly sign rather than being concerned with the other overgrown parks, abandoned properties, blight, or preservation. I am sorry that sign is ruining your day, has beaten you over the head, or caused family issues since I am sure you visit it daily and it is in your way. If you are on a witch hunt over a sign, what would you do if he changed the park layout or add or remove things since he was given that opportunity? I am sure the ‘?’ on the map were only there as place markers since it is too far out to determine what will transpire. The documents online are old and haven’t been updated so I suspect you would need to go down to the city to see the latest documents and plans. It was originally advertised to be open in August this year but that is obviously not going to happen. Despite all of Eric’s bluster, it appears that the structures for the signs were taken out by the city today. @52 James, I am sure Builder let them do it since he has been reading this thread and knows how people feel about it. Rather remove them than have all of the unjust flack. But like I said, hope you will feel the same when the conference center, which will face Broad and have access to it through the park, will be to your liking? And not complain to him if he falls behind with maintenance after being alienated.